During yesterday’s Cabinet meeting, President Maithripala Sirisena proposed to increase the VAT on cigarette up to the maximum level. He also directed the Finance Minister not to provide any relief for tobacco companies and also not to promote the tobacco industry. Following an issue which was discussed at a function President participated in the Morning, he has directed Finance Minister Ravi Karunanayake to submit a full report mentioning reasons for not to increase VAT on cigarettes. 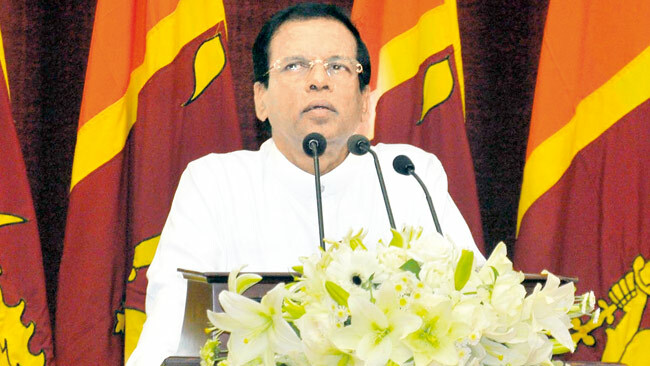 Meanwhile, President Maithripala Sirisena yesterday vowed to submit an immediate proposal to the Cabinet with regard to the implementation of the correct tax on cigarettes. The President also said that around 25,000 people die of smoking-related diseases in Sri Lanka per year and Sri Lankans spend over Rs.500 million on cigarettes and alcohol per day. He was responding to question raised by Dr. Nishan Mel at the No Tobacco Day Celebrations held yesterday at the BMICH. President Sirisena also noted that over 35 percent of the income of underprivileged families in Sri Lanka is spent on cigarettes and alcohol. Therefore, cigarettes and alcohol has become the main reason for the increase in poverty in Sri Lanka. “Now we are reaping the benefits of struggles that we launched when I was the Health Minister of the country to reduce tobacco and alcohol use in Sri Lanka. During the past two years, tobacco use in Sri Lanka has declined by 5 percent,” the President said. President Sirisena further added that he was summoned to Temple Trees by former President and was made to explain to the Tobacco Company representatives why he wanted 80 percent pictorial warnings on cigarette packs. He also emphasized the necessity of join hands to defeat the campaigns launched by tobacco companies to attract Sri Lankans for their products. The President further said the owners of tobacco companies use various gimmicks and tricks to attract Sri Lankans to their products, adding that the owners of Lanka Tobacco Company are not Sri Lankans and it was named as “Lanka Tobacco Company” just to mislead Sri Lankans. He further added that a decision has also taken to ban tobacco cultivation in Sri Lanka from 2020.
of tobacco and alcohol in Sri Lanka is around Rs 212.6 billion - Rs.71 billion for Tobacco and 141 billion for alcohol. Health Minister Dr.Rajitha Senaratna, NATA Chairman Palitha Abeykoon, Director General Health Services Dr.Palitha Maheepala, WHO South Asia Region Director Poonam Khetrapal Singh and many other distinguished guests participated at the occasion.